Posted on April 13, 2017, 1:38 pm, by admin, under Recent News. The College School, a private K-8 school located in greater St. Louis, MO, completed construction of the 6,550 sq ft Jan Phillips Learning Center in December 2016. The Learning Center will provide opportunities for students and visitors to connect with nature and explore sustainability. It was built to achieve Living Building certification. 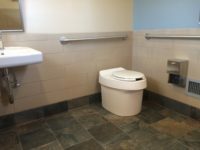 A Clivus Multrum M12 composting toilet system and greywater irrigation system were installed to help achieve the Center’s net zero water goals.